Ultimate Protector users report positive experiences after using the product. These testimonials are followed by research studies that explain why the product is effective. 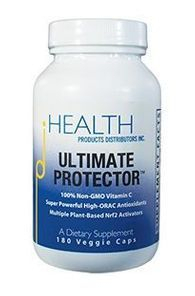 Health Products Distributors, Inc. (the company): “ULTIMATE PROTECTOR™ is a next generation cell protection formula that simultaneously meets the needs for high levels of Vitamin C, full spectrum of high ORAC [oxygen radical absorbance capacity] antioxidants, and protective enzyme activators (Nrf2 activators) in a single product. This potent combination of characteristics distinguishes the formula because no other single product available today offers such complete protection. ULTIMATE PROTECTOR is a quantum leap forward in providing total antioxidant protection from all types of free-radicals! At 486,000 ORAC 5 units per day, this is the most potent antioxidant formula you'll find, anywhere. ULTIMATE PROTECTOR is hands down the most effective cell protection, antioxidant formula ever formulated. Not only does it provide extraordinary protection for cells, but because it so effectively quenches free radical activity, it supports the health of all tissues and organ systems in the body. And, even as it keeps the body healthy by reducing harmful effects of free radicals, it also prevents, mitigates, and reduces adverse free-radical effects due to conditions of poor health that create additional oxidative stress. The formula thereby protects you both from oxidative damage that contributes to poor health and from oxidative damage resulting from conditions of poor health.” It is described quite extensively on its website www.integratedhealth.com. Adam Da Virro: This product is very powerful, after taking only one capsule I feel a tremendous balanced energy take over, and my thinking is razor sharp. This may not be everyone's experience as I am super sensitive. This product is for real!!!! Amazon.com customer reviews. PrincessSunshine: I gave this to a loved one who had bronchitis, really high doses, 5 capsules every hour and her bronchitis went away in 2 days. Ordering 5 more for myself and to give to loved ones! Amazon.com customer reviews. "The Amazing Healing Potential of Natural Nrf2 Activators"
"Description and Comparison of ORAC Tests for Well Known Plant Ingredients and ULTIMATE PROTECTOR"